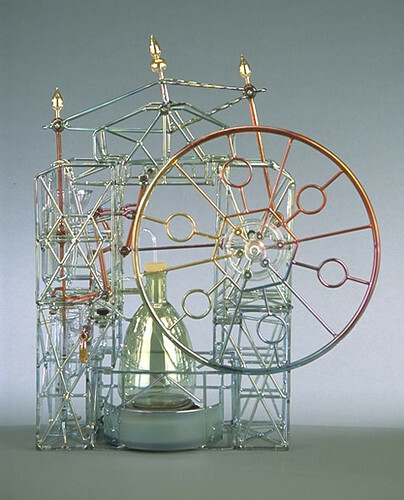 Glass artist, Bandhu Dunham creates kinetic sculpture from lampworked glass. These works even include working steam engines. The one pictured above even includes a condenser - that's a part that takes the used steam and turns some of it back into water to reuse in the engine. Dunham also creates rolling marble works. All of it is very very impressive, and even more so when we consider that they are made entirely from glass. Check out this very cool video of several of his pieces in action. Many thanks to KineticWorld regular, Jonathan Foote, for sending us the heads up on this one! The Power Tool Drag Races are back, May 17th and 18th, Ace International Speedway, San Francisco. This year's event will even include some great live music, we're told. I will not be racing this year - it's my first time not racing at PTDR in quite a few years. Truth be told there are just too many other things on my plate, but I'm okay with that. I'm telling everyone that I've decided to just be happy being a retired champion. I will be spectating though...and undoubtedly heckling as well. Anyhoo, get over to the speedway and check it out...it's always a blast. Ace International Speedway, 2255 McKinnon Street, San Francisco...$20 per person at the door to watch, $30 to race. The first annual RoboexoticaUS opened at Space in San Francisco last night to a very enthusiastic reception. Most every machine worked beautifully, and I even managed to get my Breathalyzer Genie working at the last minute after a move from one room to another mysteriously (and maddeningly) disabled it. As soon as I find a good picture of Simone Davalos and David Calkins I'll post it - they are the organizers of RoboexoticaUS. RoboexoticaUS this Saturday, May 10th!!! Sorry about the short notice, but tomorrow night in San Francisco is RoboexoticaUS, the US sister event to the one in Vienna every Autumn. "What could be better in life that robots and cocktails? Well, nothing! 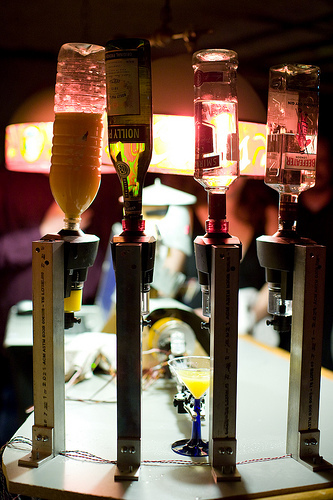 Roboexotica is the premier cocktail making robot event which happens in Vienna each year. This week it comes to San Francisco. 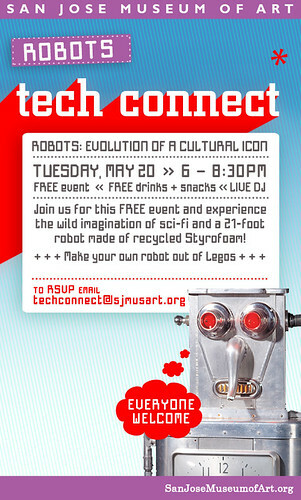 Join us for good music, cocktails, and robots that pour you drinks, insult you, and test your BAC. 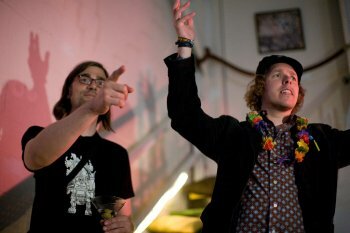 Several different artists from around the Bay Area and Europe will be presenting their work for your imbibing pleasure." 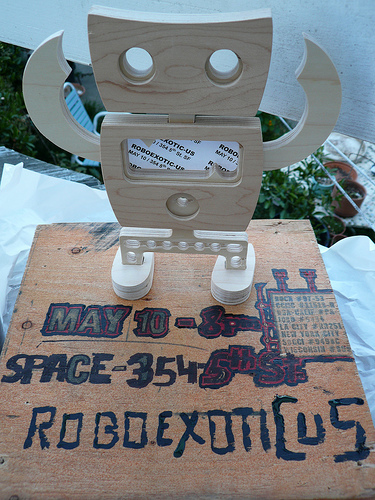 RoboexoticaUS - 8pm-2am this Saturday, May 10th at Space, 354 5th Street in San Francisco. Paul Da Plumber (aka Paul Cesewski) is the current Artist In Residence at the San Francisco dump. 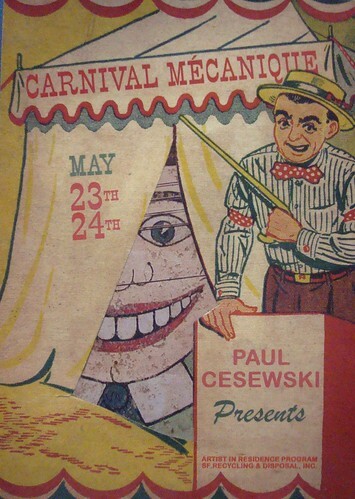 As part of that residency, every artist who holds the 4 month position has a culminating show, and Paul's is on May 23rd and 24th. I've been to see the work in progress a couple times now, and I can tell you that this show is going to be a blast. Paul has long made some of my all-time favorite pedal powered works, and he definitely won't disappoint this time around. That's all I'm going to say, the rest will just have to be a surprise. "Fun is the universal language. Information is learned through visceral experience. Exploring ourselves through motion - we face our joys and excitement as well as our fears and hesitation. Physical memories hold lakeside property in our consciousness. 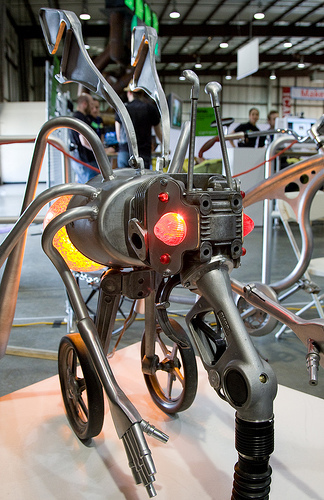 Much of my artwork consists of bicycle powered kinetic sculpture. Participants move themselves through space by pushing bicycle pedals. People powered machines engage us in active participation with the machines. The process of propulsion is in the hands of the participant. 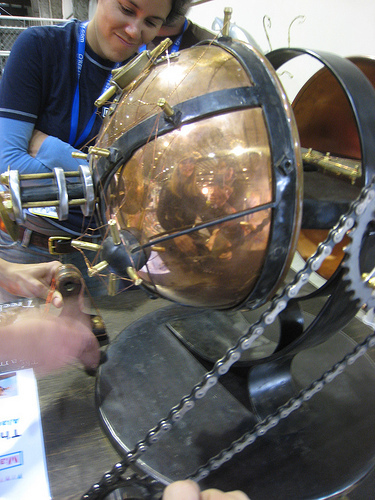 The participant can experiment with the machine and respond to stimulus directly. We experience the organic nature of propelling ourselves. Playful interaction with the machines results in an individual experience for the participant. Personalities are often revealed when participants act and react. Machines with multiple riders counterbalance each other. The dynamic between participants further unfolds. The machines become personality amplifiers." The show I curated (or as Nemo Gould put it, "he's the glue that holds this all together") for Maker Faire 2008 was a big hit. The number of visitors to our space far exceeded our expectations, and it was a treat to host them all! We needed a name for our group, and Nemo came up with Applied Kinetic Arts, so that's what we were called. In fact it was so much fun I bought the domain! Click here for AKA, and soon there will be something more to see there. I stayed so busy (and over stimulated) that I think I may have taken all of 10 pictures all weekend, but many others were much handier with their cameras so we will be bringing you more pix, or at least links to pix, in the near future. Fresh off our jaunt to Coachella 2008 we are off to Maker Faire 2008 in San Mateo, California. I have worked on putting together a group show of kinetic and mechanical works that we will be showing under the name "Applied Kinetic Arts" - Artists involved include Nemo Gould, Alan Rorie, Carl Pisaturo, Reuben Margolin, Jonathan Foote, and yours truly, CTP. We are set up in the Expo Hall in space #207. If you are at the faire please come by and say hi. 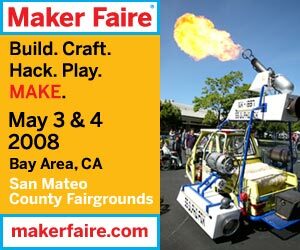 We will be uploading pictures of Maker Faire as often as we can this weekend.